Four hundred years ago, sky watchers, including the famous astronomer Johannes Kepler, were startled by the sudden appearance of a "new star" in the western sky, rivaling the brilliance of the nearby planets. Now, astronomers using NASA's three Great Observatories are unraveling the mysteries of the expanding remains of Kepler's supernova, the last such object seen to explode in our Milky Way galaxy. When a new star appeared alongside Jupiter, Mars, and Saturn on Oct. 9, 1604, observers could use only their eyes to study it. The telescope would not be invented for another four years. Modern-day astronomers, on the other hand, have the combined abilities of the Spitzer Space Telescope, the Hubble Space Telescope, and the Chandra X-ray Observatory at their disposal. 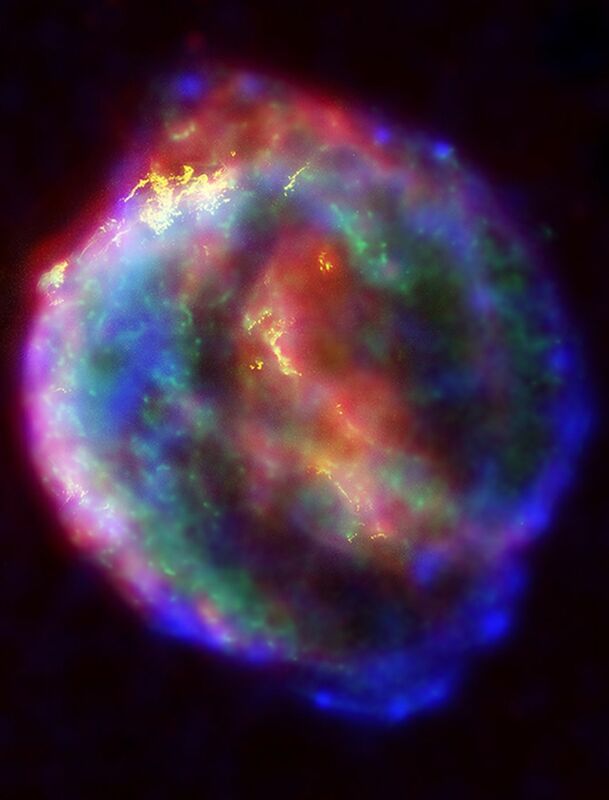 A team of astronomers, led by Ravi Sankrit and William Blair of Johns Hopkins University in Baltimore, Md., are using the Great Observatories to analyze the remains, called Kepler's supernova remnant, in infrared radiation, visible light, and X-rays. The combined image unveils a bubble-shaped shroud of gas and dust that is 14 light-years wide and is expanding at 4 million miles per hour (2,000 kilometers per second). Observations from each telescope highlight distinct features of the supernova remnant, a fast-moving shell of iron-rich material from the exploded star, surrounded by an expanding shock wave that is sweeping up interstellar gas and dust. "Multiwavelength studies are absolutely essential for putting together a complete picture of how supernova remnants evolve," said Sankrit, an associate research scientist in the Center for Astrophysical Sciences at Johns Hopkins and the lead astronomer on the Hubble observations. "The glow from young remnants, such as Kepler's supernova remnant, comes from several components. Each component shows up best at different wavelengths." "For instance, the infrared data are dominated by heated interstellar dust, while optical and X-ray observations sample different temperatures of gas," added Blair, a research professor in the Physics and Astronomy Department at Johns Hopkins, and the lead astronomer on the Spitzer observations. "A range of observations is needed to help us understand the complex relationship that exists among the various components." The explosion of a star is a catastrophic event. The blast rips the star apart and unleashes a roughly spherical shock wave that expands outward at more than 22 million miles per hour (10,000 kilometers per second), like an interstellar tsunami. This wave spreads out into surrounding space, sweeping up any tenuous interstellar gas and dust into an expanding shell. 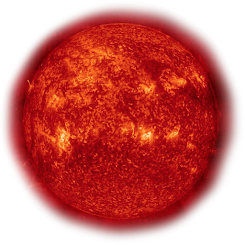 In certain cases, the surrounding regions include material shed by the progenitor star in a stellar wind before the explosion, in earlier phases of its evolution. The stellar ejecta from the explosion initially trails behind the shock wave but eventually catches up with the inner edge of the shell and is heated to X-ray temperatures. The Chandra X-ray data show regions of very hot gas. The hottest gas (higher-energy X-rays) is located primarily in the regions directly behind the shock front. These regions also show up in the Hubble observations, and also align with the faint rim of glowing material seen in the Spitzer data. Cooler X-ray gas (lower-energy X-rays) resides in a thick interior shell and marks the location of heated material expelled from the exploded star. In some other supernova remnants, the ejecta also can be seen in visible light, but in Kepler it is seen only in X-rays. This broad study of the supernova remnant also may help astronomers identify the type of star that produced the explosion. Supernovas arise from two very different types of stars: low-mass, white-dwarf stars and massive stars. Of the six known supernovas in our Milky Way over the last 1,000 years, Kepler's supernova is the only one for which astronomers are uncertain of the type of star that exploded. By combining information from all three Great Observatories, astronomers are obtaining a much clearer picture of Kepler's supernova remnant. "It's really a situation where the total is greater than the sum of the parts," Blair said. "When the analysis is complete, we will be able to answer several important questions about this enigmatic object."